No.16 in the Bantam series of Emilie Loring novels. First published in 1946. Cover Shiny, no spine creases. Initials inside. 203 tight, crisp, slightly age-toned pages. Fiction by America's bestselling author of romance. No. 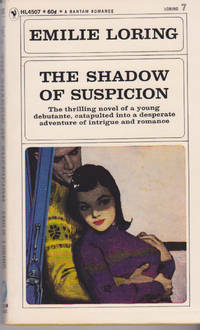 1 in the Bantam series of Emilie Loring novels. Bantam FL101 - 1964. First published in 1952. No spine creasing, Minor stain top back cover. 153 tight, crisp age-toned pages. Fiction by America's bestselling author of romance. New York: Bantam Books, 1972. No. 47 in the Bantam series of Emilie Loring novels. Bantam SL6647, June 1972 printing. 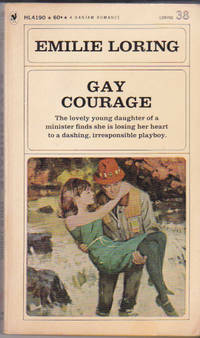 First published in 1969. Cover shiny with minor edge wear, light spine crease and crease next to spine. 185 lightly age-toned tight, crisp pages. Fiction by America's bestselling author of romance.. Mass Market Paperback. Very Good. New York: Bantam Books, 1964. No. 2 in the Bantam series of Emilie Loring novels. 3rd printing, 1971. First published in 1956. Cover shiny, faint spine crease. Store sticker front end paper. 220 tight, crisp pages. Fiction by America's bestselling author of romance.. Mass Market Paperback. Vrey Good. New York: Bantam Books, 1971. No. 4 in the Bantam series of Emilie Loring novels. 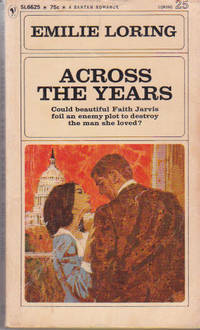 3rd printing New Bantam Edition 1971. First published in 1954. Cover shiny, no spine creases. 200 tight, crisp pages. Fiction by America's bestselling author of romance.. Mass Market Paperback. Fine. New York: Bantam Books, 1971. No. 3 in the Bantam series of Emilie Loring novels. Bantam SL6603. 2nd printing. First published in 1955. Cover Shiny, 186 tight, crisp lightly age-toned pages, light spine creases, slight cant. Previous owner's sticker and inititials on front end paper and check marks on the Bantam Book listings. Fiction by America's bestselling author of romance.. Mass Market Paperback. Very Good. New York: Bantam Books, 1974. No. 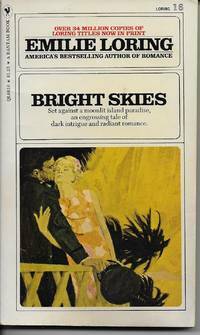 50 in the Bantam series of Emilie Loring novels. Bantam NL6650, 1st printing. First published in 1972. Light spine creasing and cant, redish stain at top spine edge, few handling dents 213 tight, crisp lightly age-toned pages. Fiction by America's bestselling author of romance.. First Thus. Mass Market Paperback. Very Good. New York: Bantam Books, 1971. No. 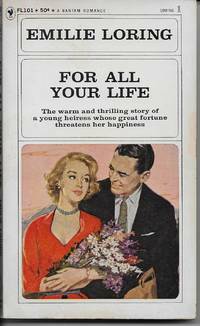 25 in the Bantam series of Emilie Loring novels. 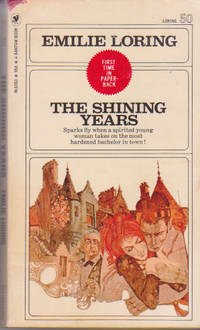 New Bantam Edition 1971, 4th printing. First published in 1939. Cover has handling creases and age-toning. Name in ink at top of front end paper. 216 tight, lightly age-toned pages. Fiction by America's bestselling author of romance.. Mass Market Paperback. Good. New York: Bantam Books, 1964. No. 7 in the Bantam series of Emilie Loring novels. 1964 9th printing. First published in 1955. Cover Shiny, faint crease along spine, small scar on front cover. Store sticker inside front cover. 152 tight, crisp, slightly age-toned pages. Fiction by America's bestselling author of romance.. Mass Market Paperback. Very Good. New York: Bantam Books, 1967. No. 25 in the Bantam series of Emilie Loring novels. 5th printing 1967. First published in 1939. Spine canted and age toned. 172 tight, clean age-toned pages. Fiction by America's bestselling author of romance.. Mass Market Paperback. Very Good. New York: Bantam Books, 1971. No. 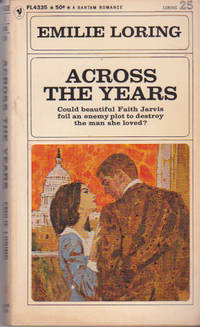 34 in the Bantam series of Emilie Loring novels, second printing 1968 First published in 1965. Cover Shiny, light edge wear, spine creases and cant. A tight crisp copy. 172 pages. Fiction by America's bestselling author of romance.. Mass Market Paperback. Very Good. New York: Bantam Books, 1968. No. 38 in the Bantam series of Emilie Loring novels. Bantam HL4190. First published in 1928. Cover shiny, minor edgewear, light spine crease. 186 tight age-toned pages. Fiction by America's bestselling author of romance.. Mass Market Paperback. Very Good. New York: Bantam Books, 1969. No. 43 in the Bantam series of Emilie Loring novels. Bantam HL4543. sticker removal abrasion front cover, light spine crease. A tight crisp copy. 186 lightly age-toned pages. Fiction by America's bestselling author of romance.. Mass Market Paperback. Very Good. New York: Bantam Books, 1964. No. 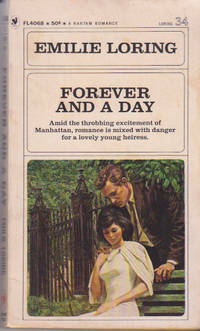 12 in the Bantam series of Emilie Loring novels. Bantam El112 published 1964. First published in 1949. Cover shiny, with top front corner missing. Short tear back cover at page edge.. No spine creases. 198 tight, age-toned pages. Fiction by America's bestselling author of romance.. Mass Market Paperback. Very Good. New York: Bantam Books, 1971. No. 42 in the Bantam series of Emilie Loring novels. Bantam HL4283 1st printing 1969. Very nice copy with lightly creased and canted spine, minor scuffing on front cover. 185 tight, slightly age-toned, crisp pages. Fiction by America's bestselling author of romance. In the shadow of a sinister conspiracy, a courageous young heiress fights to save her marriage from certain doom..... First Thus. Mass Market Paperback. Very Good. New York: Bantam Books, 1972. No. 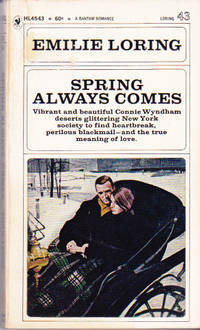 48 in the Bantam series of Emilie Loring novels. Bantam SL 6648, First Time in Paperback. Cover shiny, light spine crease and slight cant. 200 tight, crisp, pages with few top page edges slightly dog-eared.. Fiction by America's bestselling author of romance.. First Thus. Mass Market Paperback. Very Good.